Buckeye Video Game Truck is excited to be the first in CENTRAL OHIO to bringing you more than just a video game truck, we have included face painting with our services. What does that mean for our clients, a more fun and exciting gaming experience. 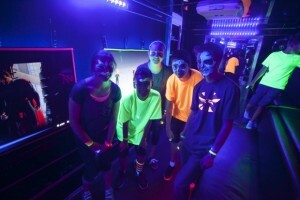 Game-N-Glow party includes everything in the Video Game Party package plus one hour with a professional face painter to get your guests ready for the party and 1 ½ hours of gaming in the mobile video game theater. Our professional face painter will arrive a half an hour before the game truck for a fantastic 2 hour experience. Wild in the jungle, super heroes & villains, Super Mario Bros., Mortal Kombat, zombie, outer space, princess, Monster High, circus, 80s disco night, Halloween, Disney, masquerade ball, pop or rock star, Frozen, slumber party.